Click the “Buy Now” button to extend your trial by 60 days², give yourself more time to evaluate Swiftlight, and get a matching credit¹ against the purchase of a full Swiftlight licence. Many users tell us that they don’t get enough time to complete their evaluation of Swiftlight during their initial 30 day free trial period. The 60 day trial extension option allows you try Swiftlight out for longer², and it ensures that you won’t lose out if you do go on to purchase a full licence as you will be issued with a credit¹ matching the cost of your trial extension which you will be able to offset against the purchase of a full Swiftlight licence within 3 months. 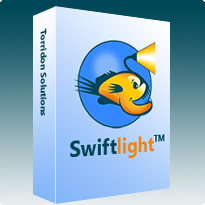 This is a low cost way to try Swiftlight out for longer. If you’re still unsure about purchasing a full licence, why not extend your trial today? ¹ Only one credit may be applied on purchase of a full licence. So if you extend your trial twice, you will only be able to offset the cost of one extension against your purchase of a full licence. The credit will be valid for 3 months from the date you purchase your trial extension. ² When you purchase, you will be sent a licence key which allows you to activate Swiftlight, unlock an expired trial version and use Swiftlight for an additional 60 days. You will only get 60 days from the date at which you activate Swiftlight, so to benefit from the full 60 day extension, your trial needs to have expired first. Torridon Solutions reserves the right to change these offers at any time.